Tomorrow Architecture, a meeting with Toyo Ito, prominent master of Japanese and international architecture, will be held in Rome during the exhibition entitled The Japanese House. The Japanese House. Architecture and life after 1945, the exhibition that opened on November 8 at MAXXI in Rome, takes visitors on a voyage of discovery of Japanese culture through home architecture and how it is interpreted by more than 50 Japanese architects. The winner of the fifth BSI Swiss Architectural Award was announced on June 23: Japanese architect Junya Ishigami. The award will be presented on September 22 2016 at the Architecture Academy of the University of Italian Switzerland in Mendrisio. The travelling exhibition Japan, Archipelago of the House, curated by architects Véronique Hours, Fabien Mauduit and Manuel Tardits, and by photographer Jérémie Souteyrat has recently opened at Looiersgracht 60 in Amsterdam. The exhibition is an investigation and research into "the Japanese house" in a physical, cultural and social context. The Serpentine Gallery pavilions are temporary structures that last only one summer. They are always designed by an architect or architectural practice that has never before built anything in the United Kingdom. Let us take a look at recent pavilions presented in Floornature. The works of Yasmeen Lari, ELEMENTAL, OMA, Shigeru Ban, NLÉ, Toyo Ito, Metabolism (Kenzo Tange and Kurokawa Kisho) and Sir Christopher Wren are examples of reconstruction projects following upon major disasters selected for the exhibition that opened recently at RIBA’s Architecture Gallery. 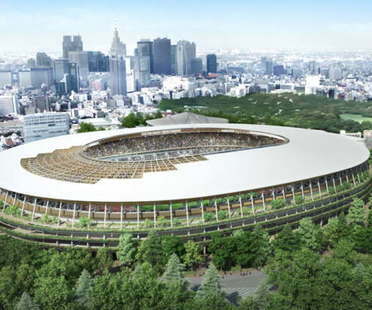 Just before Christmas the Japanese government announced its decision to replace Zaha Hadid’s project, which had won the design competition but was then rejected because of the high cost of its construction, with the plan by Japanese architect Kengo Kuma for the new Olympic Stadium in Tokyo.